There’s this overwhelming urge in the early stages of your company to prove your idea. You want to validate that you’re not just completely wasting your time. There are some really simple ways to do that validation (will anyone give you money? is your churn rate <5%?, etc). Then there are slightly more formal methods. One of the methods that a lot of startups look to for validation is “product/market fit”, and in this article we’ll take a look at what product/market fit is, how to find out if you have product/market fit, how to get product/market fit if you don’t have it, and some tools and resources to help along the way! As a caveat, I don’t think survey methods, in and of themselves, are all that special, but I think the process of doing them, and sifting through the responses, can surface a lot of interesting and actionable data. For instance, we use NPS surveys for gauging customer satisfaction. I don’t particularly care about the actual score itself, but more the individual responses. At any rate, let’s jump in! “Good” meaning that the market size is large enough to sustain a business. It doesn’t necessarily mean the market is massive, but certain niches simply don’t have a “market” regardless of how much you might want there to be one (i.e. Palm OS app for tracking your Furby collection). Practically, product/market fit just means you have a product that the market really loves and can’t live without. This is important because if a market can’t live without your product, you’re in a very strong position to grow. And if you’re in a large market, you’re in a very strong position to grow…a lot. Figuring out if you have product/market fit is as simplte as sending out a survey, but as a basic rule of surveying, getting at least a 100 responses will go a long way towards statistical significance. This isn’t a survey you send out to your first 10 customer (you need to be talking to each of them individually). This is something you send once you’ve got 100+ customers (and ideally much more). 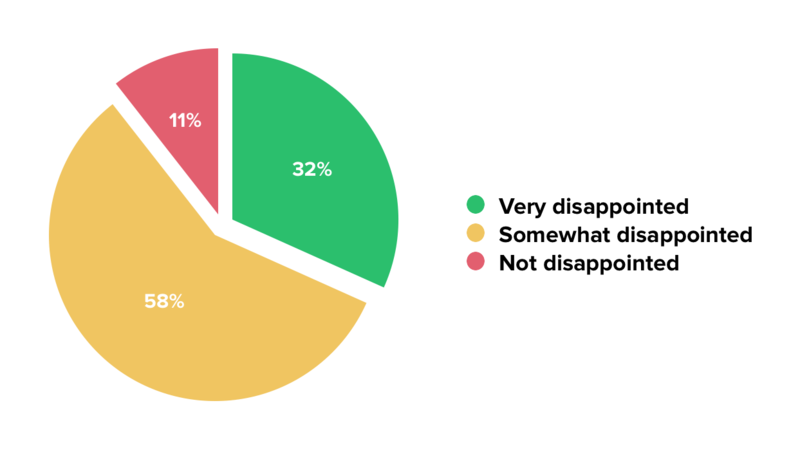 If at least 40% of your respondents answer “very disappointed”, then that is a strong indicator of product/market fit. That’s an overly simplistic way to measure it, but I also think spending too much time trying to label yourself as having achieved product/market fit can also be a little futile and doesn’t, on its own, actually improve your business. What’s more important here is the process. Sure, you could just ask that one question, run the survey and define your business based on that single number. Or, you could take the opportunity to ask a few other questions to get better context about why someone answered the way they did! 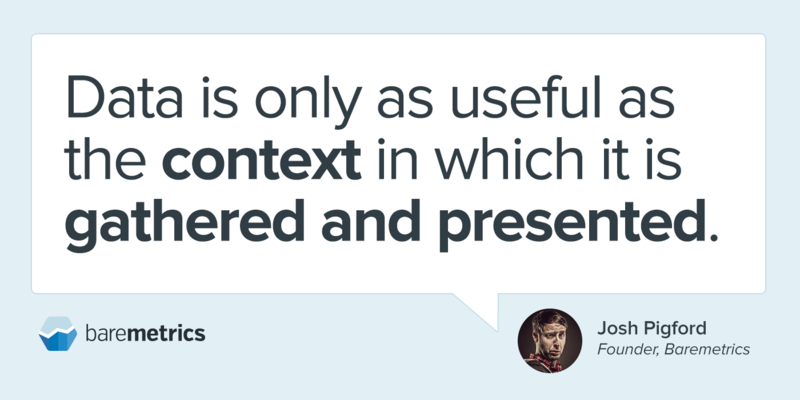 Data is only as useful as the context in which it is gathered and presented. Let’s take a look at, step-by-step, how to run a product/market fit survey. You should only send this survey to current customers. Preferably ones who have stuck around for at least a few months. If you have both free and paying customers, you should only send to the paying customers as they’re the ones who actually affect your business. Ideally your list is over 100 customers. The more, the merrier. To get the most actionable insights from your survey, here are the questions you should ask (we’ll use Baremetrics as the example company). You are trying to understand how all of your current customers are finding you. This will also help you segment the responses later on to figure out where your most qualified customers are coming from. This is the core question we’ve already talked about, with the addition of one option (N/A). You’re only including the N/A option so you definitively filter out responses from inactive customers. If they selected, for example, “Not disappointed” then you certainly want to know why they selected it. These answers are extremely insightful because they’ll point to weak spots in your product. I think most startups pay far too much attention to competitors, but if you find that a sizable portion of your customers have a competitor at the top of their mind, it’s likely because they’ve been researching. This is a great opportunity to find out exactly why they’ve been looking around for another solution. This helps you surface the main reasons customers use your product and basically writes your marketing copy for you (since you should be selling benefits, not features). Similar to the previous question, it helps surface what your customers find most valuable about your product as well as the language they use, which you can then work into your own marketing. You’ve run your survey and have a whole pile of responses! Now what?!?! The primary segmentation of responses should be done on answers to the “How would you feel if you could no longer use Baremetrics?” question. You want to find the commonalities among each of those groups of people. If the majority of customers would not be disappointed if they could no longer use your product, you’ve got a problem, and not one you can ignore. Customers do not care about your product, and when you’re building a business on your product…that’s a significant problem. Dig through all the responses, try to find out why they don’t care. Also, look at the people who said “very disappointed” or “somewhat disappointed” and see if their responses can give some guidance on how to overhaul your product. You’ve got a lot of work to do here. When the majority say “somewhat disappointed,” you’re close! Spend a lot of time segmenting the responses based on the other questions to specifically identify the customers that said “somewhat” versus “very” and compare them. Learn what the difference is between those segments, spend time talking to those customers and make a game plan for improving the product. If the majority say they would be “very disappointed”, then congrats! You’ve got product/market fit! You are likely about to or already have started to experience some solid growth. Spend time optimizing marketing messaging based on the responses to the other questions in the survey. Don’t hold back on resources (money, time, etc) that fuel growth. If you’ve ever thought about raising money, this is a prime time to do it as investor cash can be fantastic when used to fuel an already burning growth fire (I feel like I should hashtag #growthhack that phrase). Does Baremetrics have product/market fit? Back in April, we ran this very survey. In total, we got 138 responses. Here are our results. We’re pretty close! Given how early we are in the life of our company, and how much we’re expanding in the coming months, I’m happy with this. Certainly room to improve, but I think it’s a solid spot to be in. The feedback we received in the open-ended text fields has driven a lot of upcoming product features and improvements. Now that you know how to run a product/market fit survey, here are some others tools, resources and articles to help out! Quora answers to How do you define Product-Market fit? Survey.io — Tool built specifically for sending these surveys. Thank you to Hiten Shah, who’s talk at MicroConf really got me thinking and researching this as a method of product feedback.